Tabitha Dabkowski PA-C, is one of three Regional APP Directors for US Acute Care Solutions Southeast & West Region. Her territory will include all the USACS sites in North Carolina. She previously pioneered a travel APP program for the nine hospitals within the Charlotte Region of USACS and has worked at all sites as a travel APP. She has been with USACS since 2012. Tabitha received her Bachelor of Science in Biology from Worcester State College in Worcester, MA. 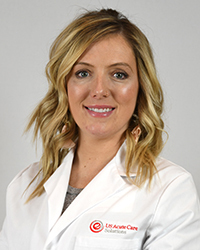 She then completed her Master of Health Science in Physician Assistant studies from Quinnipiac University in Hamden, CT.
Tabitha is a member of the American Academy of Physician Assistants and the Society of Emergency Medicine Physician Assistants. She is certified in Advanced and Basic Life Support, a certified Emergency Medical Technician, and by the National Commission on Certification of Physician Assistants. She was awarded the 2017 USACS APP of the year within her region and is currently in the 2018 USACS Scholars Class.